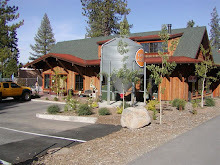 Sometime in April 2007 the first batch of beer brewed at FiftyFifty made it's way through the 10HL(8.5bbl) brewhouse and now is nothing more than a faint memory. Tomorrow, the 12th of February 2009 Kyle and I will brew the 100th batch of beer. That accounts for roughly 850 beer barrels which are 31 gallons each. I won't go into the math but it's a lot of beer over our bar at the brewpub. Sure some goes out to parties and events but most of it is sold at the pub. It's a pretty neat milestone for me as a brewer as I've only hit this mark at one other brewery. Which beer you ask? It's Manifesto Pale Ale our 'pride and joy' and it's one of the most popular beers at the brewery. We'll probably have a small celebration amongst the brewing staff and toast our efforts so far.